Prior to posting fees using Tools > Costume Management, ensure that a costume is assigned to a class and has a unit price, list price, and deposit amount entered. If costumes are not yet assigned, create one 'generic' costume to be used as a placeholder for each class. Once costumes are assigned, replace the generic costume with the correct costume information. ▼ Click here to drop down instructions on creating a generic costume for deposit posting purposes. Point to Classes in the main menu and click List Active Classes. 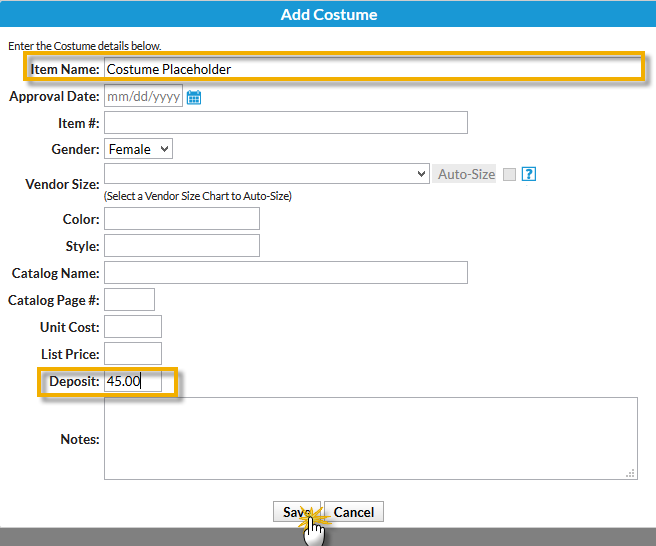 In the Add Costume window, enter a generic costume name and enter the deposit amount. Save Changes. Go to the next class that has the same deposit amount, and in the Costume tab, use the Add Existing Costume button to copy the generic costume to this class. Post Deposits using Tools > Costume Management > Post Deposit. When costumes have been chosen, return to each class and replace the 'placeholder costume' with the correct costume details, including the correct Vendor Size Chart, List Price and the Unit Price. Save Changes. Once the correct costume is entered with a List Price and a Unit Price, Tools > Costume Management > Post Balances may be used to post costume fee balances. Go to Tools > Costume Management. From the left menu, select Post Deposit / Balance. In the Post Class Item Fees window, select either Deposit or Balance. In the Order Criteria section, choose Classes, Category, Session, Instructor as applicable. In the Transaction Details to Post section, include a Transaction Date, Transaction Type, Transaction Sub-Type (if applicable), and / or Category 1. If Sales Tax should be calculated and added, check Calculate and Post Sales. Sales Tax can only be added when posting a balance, however, the sales tax is calculated on the full List Price. Review the listing. Uncheck the Post Fees column check box for any class you want to omit from the posting. When satisfied click Post Deposit Fees (if posting deposits) or Post Balance (if posting balances). 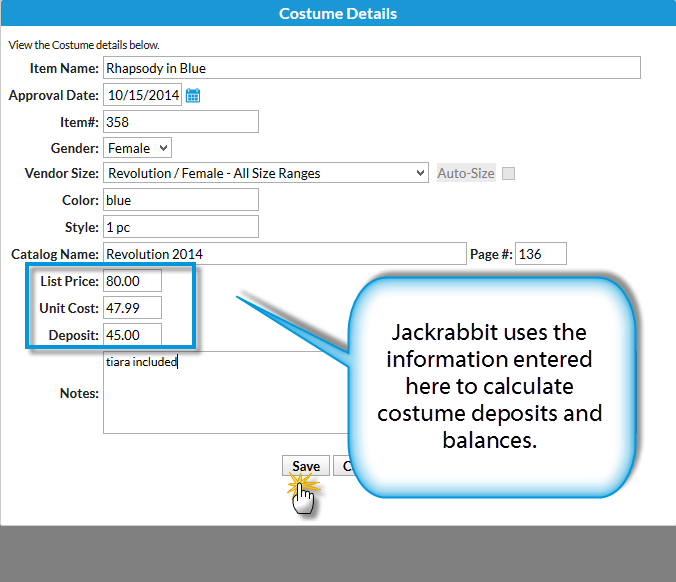 If posting a costume deposit, Jackrabbit will enter the Deposit Amount entered on the Costume Item found on the Class Costume tab. If posting a costume balance, Jackrabbit will calculate the List Price minus the Deposit Amount and enter the balance remaining. 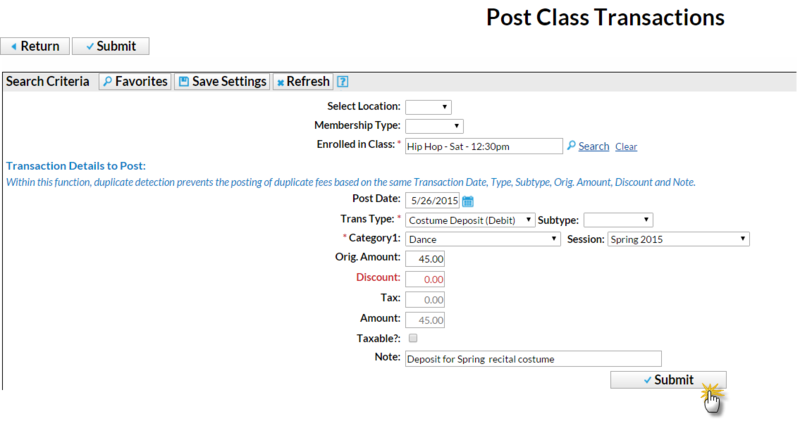 It is also possible to post Costumes Deposits / Balances by class using Transactions > Post Class Transactions. This process is more time-consuming because it is necessary to post fees by each class. See Post Class Transactions (Non-Tuition).